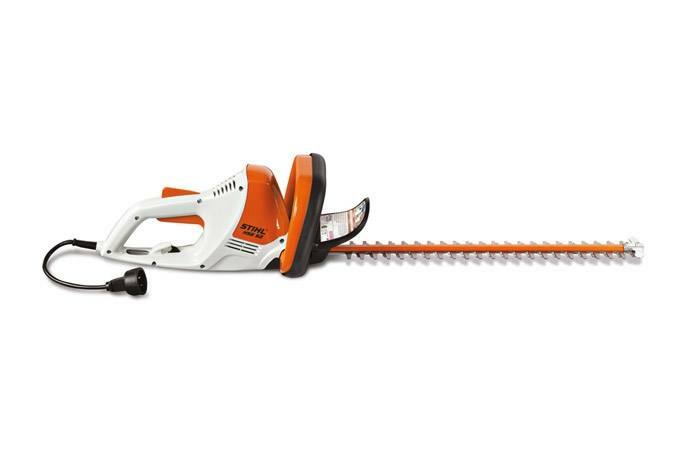 A value-packed, 20" electric hedge trimmer that's both powerful and quiet. Light, yet durable, the STIHL HSE 52 electric hedge trimmer is ideal for considerate homeowners who live in noise-sensitive areas. Nimble and well balanced, the trimmer features a 20" double-edged blade that cuts in both directions. This trimmer delivers easy, precise cutting. Its safety system features a two-handed control system, requiring hands be on the front handle and trigger lock for blade to operate. The cable-strain relief lever helps prevent the extension cord from becoming unplugged during use. The D-shaped handle allows easy cutting at different positions. Reduced-Emission Engine Technology - Caring for Nature: The STIHL Inc. “Caring for Nature" seal identifies its powered products that are more environmentally conscious, producing zero or low exhaust emissions. STIHL Inc. defines “low exhaust emissions" as being cleaner than EPA and/or CARB exhaust emission standards. Built-In Cord Retainer: The built-in cord retainer helps prevent the electrical power extension cord from becoming accidentally disconnected.